According Jensen Huang, founder of NVIDIA, "If GPUs are time machines, then GTC is where you come see the future." This is certainly true for GTC DC 2018. Attendees will see the latest breakthroughs in self-driving cars, accelerated data science, healthcare, big data, high-performance computing, virtual reality, and more. PNY is proud to be part of the excitement, showcasing the latest Quadro RTX products and demonstrating how they can accelerate design and simulation/training workflows. Held at the Ronald Reagan Building and International Trade Center, Washington DC from October 22 – 24, NVIDIA’s GPU Technology Conference (GTC DC) is the premier AI and deep learning conference series which provides attendees with training, insights, and direct access to experts from NVIDIA and other leading organizations. The Conference includes a mixture of keynotes, panel discussions, sessions and deep learning training. It covers topics including Artificial Intelligence and Deep Learning, High Performance Computing, Autonomous Machines and Virtual Reality, and how technologies like these can immediately impact industries like Healthcare, Security, IoT and Open Science. 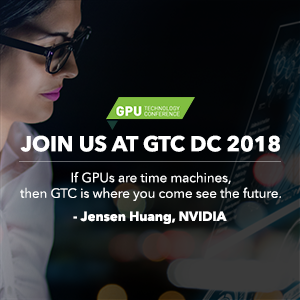 PNY invites you to join us at GTC DC to learn how the new powerful NVIDIA Quadro RTX GPUs can dramatically accelerate design and simulation/training workflows using realtime photorealistic rendering, AI and VR capabilities. PNY will showcase NVIDIA’s AI based Realtime Style Transfer that uses Quadro RTX to undertake the computationally intensive work required to produce striking results in realtime. To schedule a time to discuss your future Quadro GPU needs with a PNY Account Manager at GTC DC, email gopny@pny.com. For more information on PNY’s products, visit www.pny.com/pnypro.